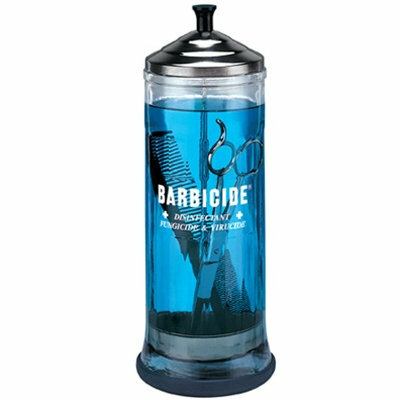 The largest of the Barbicide disinfecting jars, this one hold 37oz pf disinfectant fluid, making it easy to completely immerse hairstyling tools, shears, files and other longer grooming instruments. 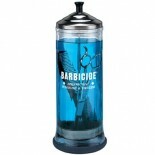 Made from sturdy glass and stainless steel, this disinfectant jar has a rubber ring at the bottom for added stability. The self-draining retrieval basket makes immersion and removal of utensils simple and keeps your hands from the disinfectant fluid. Size: 4-inch diameter; 11.5 inches tall; 37 fl. oz.